Brad Hand, who has a 5.12 ERA in 45 2/3 innings this season, has not started a game since June 8. 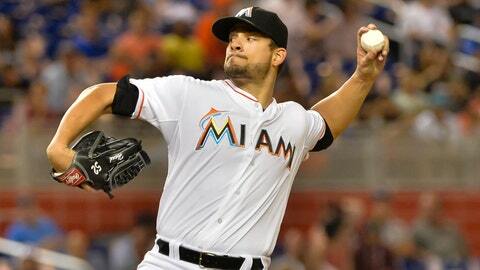 MIAMI — Miami Marlins left-hander Brad Hand will get his first start in two months Tuesday night against the New York Mets. Hand, who is 1-2 with a 5.12 ERA in 27 outings (three starts) this season, has made just two appearances since July 24. His last start came on June 2 in Toronto when he lasted just 2/3 innings by surrendering six runs on six hits at the Rogers Centre. The 25-year-old has a 5-19 record and 4.69 ERA in 34 career starts since 2011, when he made his big-league debut. He takes over Dan Haren’s spot in the rotation after the veteran was dealt to the Chicago Cubs before the trade deadline. Since Hand hasn’t thrown more than 28 pitches since June 2, Hand will be held within the 75-85 range Tuesday. "Brad has filled so many roles between being starting, between being long," manager Dan Jennings said. "He’s even been situational a time or two. His versatility’s huge, especially right now after the trade deadline and losing two pieces. It’s time for him to get that opportunity. He’s next in line to do it. (Pitching coach) Chuck (Hernandez) and I talked about it, and we’re fully confident in his ability to do that job." Since the All-Star break, closer A.J. Ramos has gone 0-2 with an 11.37 ERA, surrendering eight runs — two homers — over 6 1/3 innings with seven walks and 10 strikeouts. He has just one clean game: this past Thursday against the Washington Nationals. He has blown two saves (three total, 17 for 20) during that span, including ace Jose Fernandez’s win on Sunday. In Arizona, he loaded the bases before escaping without giving up a run. On Tuesday, he also loaded the bases with two walks and a hit before stranding them against the Nationals. In the series opener against the San Diego Padres, he gave up a season-high four runs in his second inning of duty with three walks and just one hit. Ramos went 0-1 with a 1.11 ERA in 40 first-half outings. Command, which had been a problem for him in the past, disappeared over the first 40 appearances with just 10 walks and 50 strikeouts. In just 6 1/3 second-half innings, he has already issued seven free passes. "It’s the toughest three outs to get in a game," Jennings said. "There’s no rhyme or reason. It’s just the toughest three outs. Certainly when we had (Steve) Cishek in that role and he faltered a few times and so A.J. ended up taking it over and he really did a great job and then we had the one there in Toronto. You look at the history of closers, especially in the last 10 years, even the great ones not named Mariano Rivera are going to blow three to seven somewhere in that mixture. You just don’t know when it’s going to occur. That’s the thing. It can happen back-to-back or close together. It seems to sting a little more or fresher on people’s mind. I just talked to A.J. before he came out to stretch, and I hope we get in a situation tonight because he’s going to get the ball and we have full confidence in him to do that job."